Developer Quote: "The Fraction Math app can be used to teach and study fractions by solving addition, subtraction, division and multiplication problems step by step." 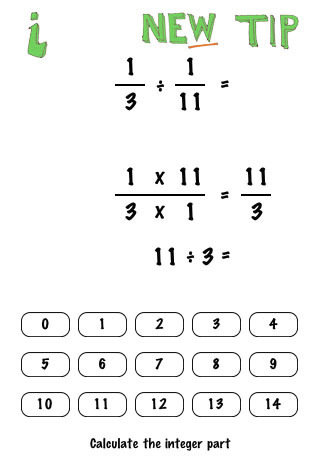 - A third-grade student can use the app to add and subtract fractions with equal denominators. - A fourth-grade student can use the app to add or subtract fractions and mixed numbers with different denominators and also to reduce the resulting fractions. 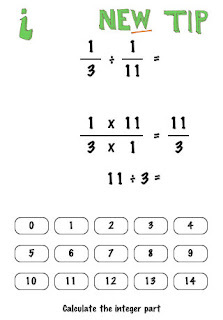 - A fifth-grade student can multiply fractions by whole numbers and other fractions. She can also divide fractions and mixed numbers. - A sixth or higher-grade student can use negative fractions, whole numbers and mixed numbers, as well as larger numbers in the problems. - The user can also see the problem and the answer in decimal notation, if preferred. - Intelligent help system - This app has a help system that provides over 60 context sensitive tips based on the state of the app. For example, when searching for a lowest common denominator, the help system will first tell how to search for the answer. If, after trying the user cannot find the answer, the help system will note what is the lowest common denominator. - Smart keyboard - When the user has to enter numbers, the Fraction Math app uses the same intuitive smart rolling keyboard as other apps by the developer. Every step is animated - In dividing two fractions the second fraction is first inverted by turning it upside down. The inverting is animated. Fun illustrations - The 60 different tips have a lot of information about fractions, mixed numbers, improper fractions and reduction of fractions. The tips have over 50 illustrations. Three different themes - The app has three different themes. The Happy theme has illustrations. If the older student prefers a theme without illustrations, there is also a black and a white theme. Fraction Math may be the best helper that parents ever had. With its well implemented tutoring and explanation methods, children will easily grasp the concepts behind fractions. Animations and simplicity of teaching in this math app will ensure that your child does not become frustrated. Help your student succeed with confidence and a greater understanding in Math class of the core concept of fractions.